I have finally been converted over to the dark side: I own Awoken Liu Bei on both accounts. Puzzle and Buttons is a strange concept for me as I have only seldom used my old Australis paired with Liu Bei team despite having 3 max skilled Dios . However, now that I have the strongest leader in coop, I took the time to browse the ALB Discord Server for team building inspiration. The ALB Discord server has sample team builds for every dungeon imaginable along with strategy and step-by-step instructions. It is also a way to connect with other Awoken Liu Bei users and I highly encourage you to take a look. 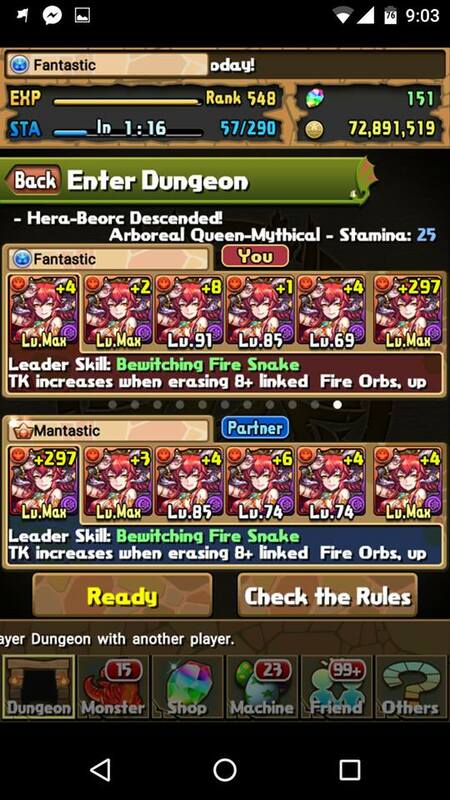 The Liu Bei team I use to farm Special Descend Rush is significantly faster and less mentally taxing than my previous Sarasvati team (full breakdown can be found HERE). Outside of speed, Liu Bei teams rarely induce mental fatigue as they are so straight forward and is a significant boon when playing a dungeon over and over again. My team is quite similar to the Discord team, but these should be used as a template as you may be missing a few of the key cards to success. Lacking the template team is sometimes a nice thing as it requires you to theory craft your own team and it did take me around an hour to commit to this team. Being able to solve these types of puzzles and using the cards you have been dealt is one of the aspects of PAD I do enjoy. The strategy I use is to one shot Zaerog Infinity through his 75% damage reduction shield. This is done via a damage enhance, a full board enhance, and Dragon and Devil Killer awakenings. Awoken Liu Bei has been released in North America and has caused quite the storm with his arrival. However, his true power is not as apparent as other top tier leaders and I want to explore why Liu Bei is relevant and how you go about making a successful team for him. Awoken Liu Bei would normally be a lackluster leader due to the active clause for additional healing and recovery. Granted you would probably be needing an active to match 9 wood orbs, but we have seen from before that skill delays (or in the case of skill binds due to no SBR ) can ruin these types of leaders. However, with the introduction of coop, we now have the actives from 10 different monsters as well as their awakenings. As such, Awoken Liu Bei teams are able to form a push button team to farm some of the most challenging content available.